Is Gaelscoil í Scoil Naithí a bhfuil oideachas iomlán an pháiste tré mheán na Gaeilge mar phríomhaidhm aici. Tá an scoil faoi phatrúnacht an Ardeaspaig Chaitlicí, agus feidhmíonn an scoil faoi ghnáthrialacha na Roinne Oideachais. Curaclam páiste lárnach atá i bhfeidhm a aithníonn luach agus eagsúlacht gach páiste agus a chuireann ar a chumas an fhorbairt iomlán is dual dó/di a dhéanamh mar pháiste, agus ina shaol sa tsochaí. Tá sé mar aidhm againn timpeallacht shuaimhneach a chrúthú ina ndéantar cúram d’fhorbairt intleachtuil, fhisiciúil, chúlturtha, mhóralta, spioradálta, shóisialta agus mhothúchanach an pháiste. Tá comhoibriú, dea-bhéasaí agus dea-iompar riachtanach d’éifeacht na scoile agus d’fhorbairt agus dul chun cinn na bpáistí. Déantar dea-luachanna Críostúla a chothú. Spreagtar páistí i ngach gnéith den chultúr gaelach—teanga, cluichí, ceol, damhsa agus traidisiúin. Tá rannpháirtíocht agus tacaíocht na dtuistí mar chuid thábhachtach de shaol na scoile. 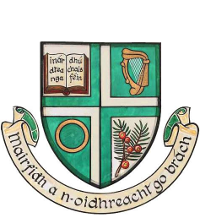 Scoil Naithí is a Gaelscoil whose primary aim is to fully educate the child through the medium of Irish. Scoil Naithí is under the patronage of the Catholic Archbishop of Dublin and functions in accordance with the rules of the Department of Education. A child centred curriculum is in place which recognises the value and uniqueness of each child and where everyone is encouraged to develop to their full potential. We strive to provide a peaceful, caring environment in which all aspects of the pupil: intellectual, physical, cultural, moral, spiritual, social and emotional development are nurtured. Co-operation, courtesy and good behaviour are essential for the effectiveness of the school and for the development and progress of the children. Good Christian values are also promoted. We encourage the children to participate in every aspect of our Irish culture — language, games, music, dance and traditions. Parental participation and support is an important aspect of school life. Is scoil aon sraithe do bhuachaillí agus do chailíní í Scoil Naithí. Tá rang amháin againn de gach rang ó Naíonáin Shóisir go Rang a 6. Tá ceathrar múinteoir déag ar fhoireann na scoile agus beirt Chúntóir Riachtanais Spesialta againn sa scoil. Tá 8 seomra ranga againn agus seomra breise amháin. Tá halla mór againn sa scoil agus Amharclann ar chúl na scoile. Tá Naíonra Naithí lonnaithe ar an suíomh céanna ach is Naíonra iomlán neamhsplách é.
Scoil Naithí has eight classes, one of each class from Junior Infants to Sixth Class. All classes are mixed (boys and girls). There are fourteen teachers on the school staff and two Special Needs Assistants. We have 8 classrooms, a seomra breise, a big hall and a Theatre out the back of the school. Naíonra Naithí is also located on the same premises but it is independent to the school.